A UV Strip is essential protection for furling sail left exposed to the sun when not being used. Ultraviolet rays will drastically reduce the strength of your sails if they are left exposed. Whilst your main sail should be protected with a sail-cover a UV protective strip is the usual way to keep the sun away from load-bearing cloth in a furled headsail. 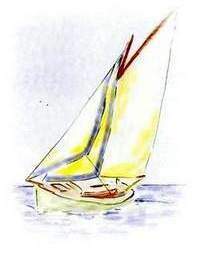 Unfortunately though, they will compromise the shape of a reefed sail by padding out the leech and foot, thereby encouraging a fuller luff, which is why true racing boats never have UV strips. However, for the average cruising sailor a lightweight, UV material sewn onto leech of a sail is more convenient than stowing the sails at the end of every cruise or hoisting a sock over the rolled sail. It is best to use a proper UV resistant cloth if you want it to last. You could use an ordinary, rot-proof lightweight material but it won’t last long, depending, of course on the amount of sun it is exposed to. Acrylic is recommended because it is UV proof, but it is expensive and heavy. There is UV protected Dacron, but something like Sunbrella will last longer, the down side of Sunbrella is that it is heavy. Don’t forget that any thread you use will also deteriorate, you can get UV resistant thread but it is lot more expensive. There is also a UV coated sticky-back lightweight Dacron which doesn’t need to be sewn. The sticky-back stuff is more expensive and it does not last as long as some of the heavier materials. The other problem with sticky stuff is when it comes to replacing the UV Strip later, it can be messy. Also it might be also worth considering the colour of the UV strip, red pigments, for instance, are notorious for fading. To work out the amount of cloth needed you will need measure the length of the leech and the foot of your sail, don’t forget the foot. If you are going to cut you cloth on the bias (crossways), which is best for several reasons, (stretch and sewing smaller sections). Now divide the leach length by the material width to give the number of sections required. Then multiply this by the width of the strip required. Repeat for the foot length, which is often a much thinner strip. The width of the strip on the leach will depend on the size of the ‘roll’ when it is furled. It should allow for turning the edges under, for some wrap around the leach to protect the edges and for a reasonable amount of overlap when furled (9 to 10 inches?). The width of the foot strip will depend on how high the clew is when the sail is furled (2 to 3 inches?) or make it the same width as the leach strip. My own (very scientific) method for working out things like that is to take my tape measure with me to the marina, find a similar looking boat and sail and take my measurements from that. But if you are replacing the old strip use that as the guide but add a little so that you are not sewing it through the old stitch holes in the sail. If you do go have a look at other boats you might notice that many of the UV strips are not cut ‘on the bias’ but along the grain. So you might be tempted to just cut your material down the length of the roll. You could work out the width of you strips based on the width of the cloth, a 60" wide cloth could be cut into four strips of 20”(?). 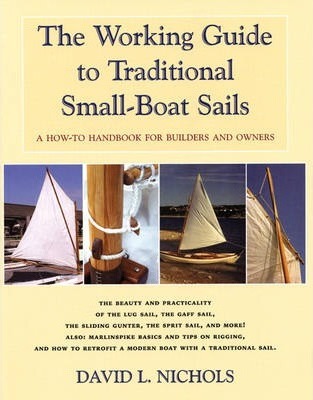 All very well if you have a sail loft and are working on a nice new sail. But sewing long lengths can be difficult if you are trying to do this at home on a domestic sewing machine. Many of these cloths, sail cloth in particular, are as slippery and difficult to work with as a politician, especially if using a domestic sewing machine, (not that I've ever used a sewing machine on a politician, been tempted though). So, working on small sections makes life much easier. And on a large sail the extra stretchiness along the length of the strip (from cutting on the bias) helps keep the strain off the stitching. However, the edges of bias cut material are more likely to fray, so when cutting the cloth use a hot knife, it will seal the edges. The other thing is that many sails have a ‘hollow’ leech, one that is slightly curved. So, if you want to fold the strip around the leach it will be easier to do in this in short sections. As you do each section stretch it out on a board or table, pin it or clamp it to keep it flat then use either glue or double sided tape to hold it in place. The glue is just to hold it in place while you run it through the machine, so preferably a glue that remains flexible when set and allows time for adjustment. Removing old glue, when it comes to replacing the strip, can be a problem. However, one advantage of a spray on glue over the back of the patch is that it helps prevent the strip filling with air when sailing. If you prefer not to use glue then some diagonal stitching across the strip will help reduce the possibility of the strip filling with air and billowing. Before you take it to the sewing machine, pull the sail out and stretch it into its normal shape to check that that there is no tension in the UV strip. You'll need to use a reasonably good sewing machine with strong needles. Corners, where there are multiple layers of reinforcing patches will have to be hand stitched. An alternative possibility is a product called ‘Tedlar®’ this is a Polyvinyl Fluoride Film which is made by Dupont. Apparently it is very light weight, flexible and clear so if you have colored sail it will allow the colour of the sails to show through. It can also be bought as a narrow sticky tape, which might be worth considering as a way of covering that trailing edge. 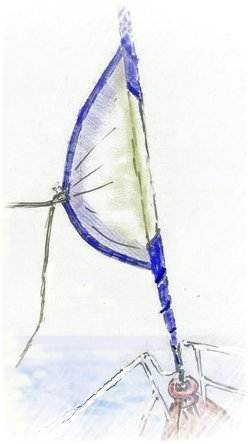 An alternative to a UV Strip is to make a covering tube for the sail, one that is hoisted up on a spare halyard, or even something like a spinnaker snuffer to pull down. The only problem is that you have more paraphernalia up the mast, more stuff to go wrong, get tangled etc. And these bags tend to flap and be noisy when it’s windy. Of course you could just remove the sail each time and stow it below (something everyone should do if the boat is laid up for any length of time). But most folk would prefer to lose a bit of sailing performance rather than lose the convenience that a roller furling or reefing system provides, so a UV Strip is the best answer.